USAF begins NATO mission in Iceland. Late on July 30, the United States Air Force deployed an F-15C/D fighter detachment and approx. 280 airmen to Keflavik Air Base, Iceland providing NATO Airborne Surveillance and Interception Capabilities to meet Iceland's Peacetime Preparedness Needs. For several weeks at total of 13 U.S. Air Force F-15C/D jets from their home base at Royal Air Force Lakenheath, United Kingdom, will conduct the NATO mission; four of them providing intercept capabilities and the remaining nine will conduct training missions to maintain and hone skills and proficiency. The jets will be flying under NATO authority, controlled by the Allied Combined Air Operations Centre at Uedem, Germany, via the Icelandic Coast Guard Control and Reporting Centre at Keflavik Air Base. 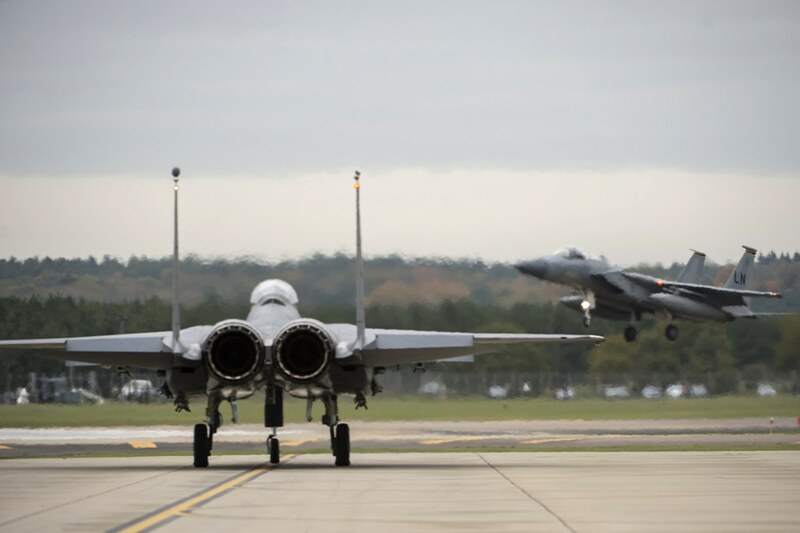 In addition, the 31st Fighter Wing, 606th Air Control Squadron from Aviano Air Base, Italy, will send a command and control team to support the Allied mission and provide tactical control for the fighters. The mission in Iceland is well-known to the U. S. Air Force, as this is the eleventh time since 2008 their jets deploy to the Ally in the High North showcasing Allied solidarity and the transatlantic link. Three times a year, Allies deploy jets and personnel to Iceland for several weeks to ensure the Alliance can conduct full-scale peacetime Air Policingactivities at the shortest possible notice if required by real world events. The mission NATO conducts in Iceland is a peacetime mission, which is specific and unique to Iceland. Due to the geographical situation, Allies in cooperation with the Icelandic authorities have agreed that a temporary presence of the NATO aircraft in Keflavik is essential to secure the Icelandic airspace. This mission will continue to assure Alliance members of the collective resolve and ability to protect all members.